FishVille hints at new mystery feature - what will it be? Players who logged into FishVille today were greeted with a button teasing a brand new feature. While we're not 100% sure what this is, there are a few great guesses based on the image. 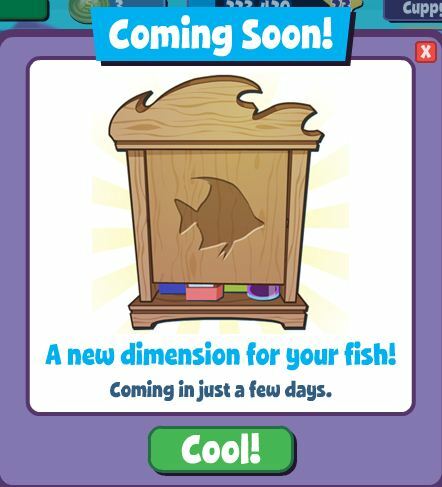 The teaser picture looks as if it is either an aquarium stand or a storage cabinet of some sort. Players have been begging for storage for their FishVille decorations for a long time, so this would be a welcome addition to the game. This could be something else altogether though. FishVille claim a "new dimension" for our fish. Perhaps this is just decorative stands without any functionality? We're not sure what it is because FishVille are being awfully sneaky about this. What are your best guesses? Storage, or something else altogether?